1. CANTA: HECTOR LAVOE written in CAPITAL letters underneath WILLIE COLON. 2. There is an indentation of about 2 spaces in between the last track title and the Recording Director, and Produced By credits. 3. 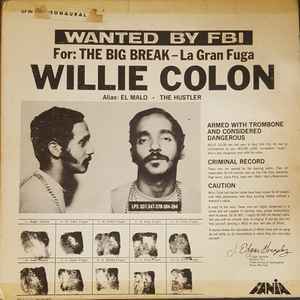 The credits for: Recording Director, and Produced By ARE NOT shown flush left as the 1st US Stereo Repress of Willie Colon* - Wanted For: The Big Break - La Gran Fuga. The 1970 US 1st Stereo and Monaural editions are titled with the branding of: "WANTED BY FBI" on the top of the front cover, and included the "WANTED BY FBI" poster. The title on both the Stereo and Monaural 1970 US 1st Repress, and of the 1972 US 1st Repress/Reissue editions are rebranded with "WANTED," and did not include the "WANTED BY FBI" poster. The 1970 US Fania Records Stereo and Monaural Cloud label variation editions include a hash tag (#) in front of catalog release numbers on the right side of the center record labels. This hash tag (#) was omitted from the center record labels of the 1970 US Repress, and from the 1972 US Repress/Reissue editions as well. This version is the 1st 1970 original Stereo release of: 'WANTED BY FBI,' WITH poster, and WITHOUT a red sticker branding on the bottom front cover of: "This Album Contains: 11' X 23" Willie Colon WANTED POSTER - The New Smash Hit GHANA'E." OjO: Side B has a 5th track, separated by about 6 seconds following track 4, which IS NOT shown on the jacket or label, and it is a Ranchera. OjO: There are Reissues of this Repress release that ARE NOT in this Data Base yet. So ask other sellers if theirs is identical to ALL pictures shown here before purchasing. So BEFORE you purchase what is being sold as an original copy of "WANTED BY THE FBI," make sure that you ask the seller for pictures, or written confirmation that their version is the legit as shown in all pictures and as described in their respective Matrix's. The original 1970 Mono version included the infamous poster "Wanted By FBI-La Gran Fuga." This poster was pulled from the market because people were actually calling the FBI to inform them that they knew where Willie and his cohorts were at. In Willie Colon and Hector Lavoe's 1970 Original LP "Wanted By FBI - La Gran Fuga," there was an infamous poster that was included inside the jacket, but was eventually pulled from the market because people who saw the poster believed it to be genuine, and were actually calling the FBI to inform them that they knew where Willie and his cohorts were at. This lead to the FBI office to place a Cease and Desist ordered Fania Records to pull all remaining copies, rebrand title, remove, reseal and sell them without the poster.